Jordan's next class will be on Feb. 19 at 5 p.m. at Selby Public Library. When Alex Jordan was 10, she moved from Ethiopia to Sarasota with her family. Ever since, she's been bringing the flavors of her home country to our city—and last year, she started offering cooking classes to the public. It's a natural evolution, Jordan, 34, explains. 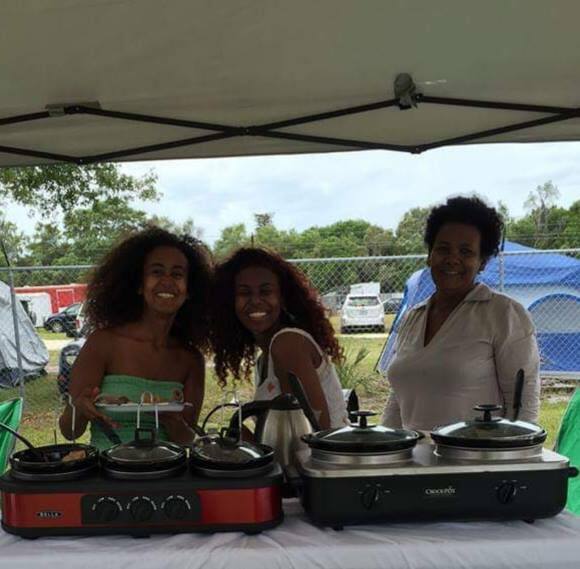 "My sister had an Ethiopian restaurant here called Fly, and I had another friend who organized a multicultural food festival and invited me to make Ethiopian food," she says. "My sister is in Tampa now, but she came down, and she and my mom and I cooked together there." Jordan (left, in green) prepares Ethiopian food. The response at the festival was excellent, she says, with people asking Jordan if she had a restaurant, and where they could get the kind of food she'd made. "Finally, I wrote down my number and said, 'I'll make some food for you,'" she recalls. A friend suggested she offer cooking classes, and her passion project was born. And the dishes are perfect to make in a classroom setting, too. "Ours is a very welcoming, hospitable culture, and food is always shared—it's very communal," Jordan explains. "Your neighbors come over, and after every meal you have a coffee ceremony." 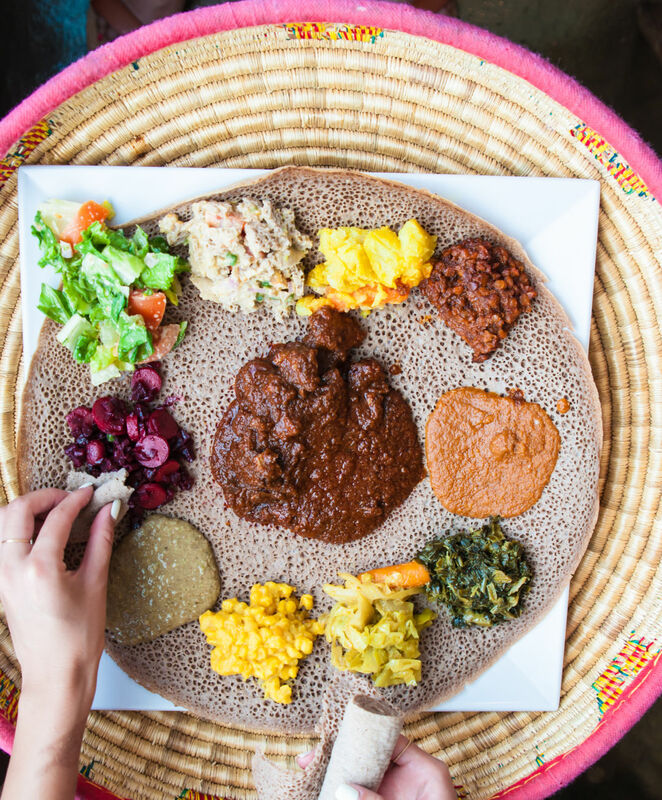 Ethiopian food is spice-forward and vegetable-heavy; stews and curries—or wat—are traditional, and may include vegetables, lamb, chicken or beef. Berbere—a spice mixture usually made up of chili peppers, garlic, ginger, basil, nigella and fenugreek, among others—features heavily, and a hallmark of the cuisine is spongy, fermented injera bread, made from teff flour. The dishes Jordan prepares during her classes are vegan, so they suit a wide variety of palates and dietary preferences, but they certainly don't sacrifice flavor. At the November class at Selby Public Library, dishes included spiced red lentils, atkilt alicha (a cabbage and potato dish); a green lentil salad with tomatoes, jalapeños and a simple dressing of lemon, olive oil, red wine vinegar and rosemary or basil; a fuchsia beet and potato dish with cumin, turmeric, ginger and garlic; and that fluffy injera bread, which Jordan prepares in advance due to its fermentation time, although she hopes to offer an injera-making class in the future. After each class, participants leave with Jordan's recipes, so they can make the food themselves. Jordan's next cooking class will be at Selby Public Library on February 19 at 5 p.m., and she wants to offer more this year. She'd also love to work in schools, using campus gardens to teach students about how to use local produce and make Ethiopian recipes. "Lots of people are asking for more classes," she says. Here's hoping she gives the people what they want. Meanwhile, for more details about Jordan's February class, check her Facebook page for updates.